Collectibles are huge with the public! This is a very fascinating section of the antique tractor hobby. Many companies produced a dizzying array of trinkets to help advertise their products. At the time of manufacture, you can bet the people involved had no idea that matchbooks, lighters, oil cans and hats with tractor name brands on them would have such an intoxicating effect on enthusiasts today. 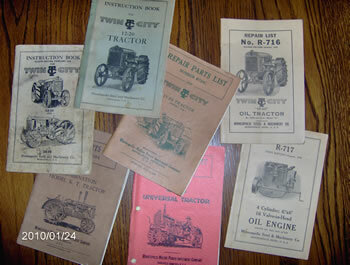 Original literature is highly coveted among tractor collectors. Much of it is brightly colored and has images of our favorite tractors with descriptive text that can even help us piece together missing history. Manuals and parts books can be a valuable tool during restorations. Originals in good condition have also become a favorite collector item for old iron hounds. The common well known brand names like Ford, International, and John Deere produced so many collectable items over the years that they can be found rather easily in many parts of the globe. 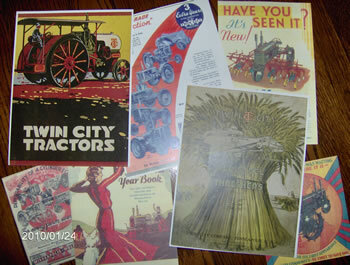 Twin City or Minneapolis Steel & Machinery collectibles offer up a whole new challenge to those who pursue them. These items are few in numbers and can make them very difficult to obtain. Some of the more desirable items are manuals, original literature, watch fobs, signs, and tractor parts for some of the lower production machines. There are model toys, clothing, jewelry, and some other memorabilia that may be best labeled as trinkets. While these pieces are great fun to share and collect, they have little or no real value. Original paper or literature is perhaps the most proliferate of available Twin City collector items. This includes manuals, sales brochures, advertising literature, post cards, and photographs. Watch fobs were popular before wristwatches entered wide spread use. Usually made of non-ferrous metal, fobs were attached to a pocket watch via a leather strap or chain. The exposed promotional fob was used to pull the owner’s watch from a pocket. Twin city fobs are demanding increasing premiums these days. One of the most desirable fobs was fitted with a celluloid center that had detailed printing of early TC tractors. Many Twin City signs were made of wood or cardboard and were often exposed to the elements, leaving few survivors in good original condition. Limited numbers of posters and calendars were offered but are pricey and difficult to locate. 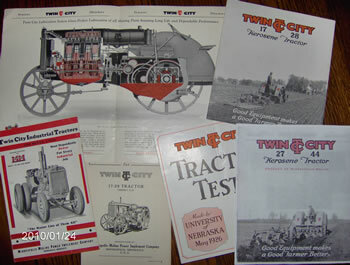 Twin City tractors are fairly low production, making many of their leftover or extra parts very collectible as well. Twin City wrenches are almost non-existent. Most wrenches of the era were made by Moline Plow Company. When pursuing the purchase of higher priced memorabilia, remember that Minneapolis Steel & Machinery and the Twin City name began a transition to MM after the 1929 merger. To be valuable, the item must be period correct and in well preserved condition. 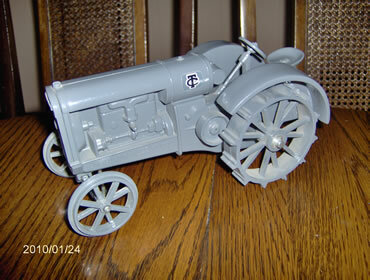 Many collectibles were made by clubs and tractor enthusiasts in the last forty years. These “recent” collectibles are the ones often referred to as trinkets. While they do qualify as items of interest, caution must be applied to the prices paid for them. Group photos on this page including the manuals, sales literature, brochures, a sign, and an old photograph that are examples of desirable, period correct memorabilia. The sign shown with a black background is cardboard. Several variants of this basic design appeared in wood, tin and on Twin City trucks as sideboards. 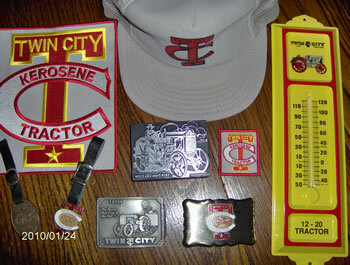 All original TC signs have collectors scrambling to own them. The trinket collection photo has only two pieces of any accountable value in it. The bronze watch fob and the 12-20 printers block were made at the time of tractor manufacture. All Twin City toy models were made in recent history. Some efforts were relatively crude and will carry minimal price tags due to their lack of detail. 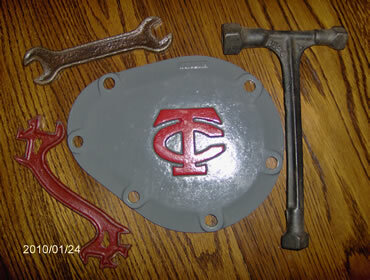 The oval shaped KT, MT, PTO cover is a good example of a collectible TC tractor part. It was only used on the early models that total about 2,500 units combined. Many of these tractors were equipped with a PTO; meaning that this cover was not needed, resulting in very limited production. The same cover appeared soon after the merger with a replacement MM on them and is quite common.